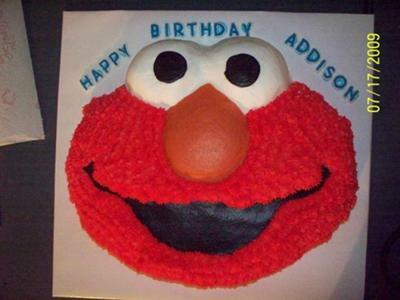 This Elmo cake is for the same little girl that I did the 2 Barney cakes for. I used the Elmo shaped pan and one cake mix prepared according to directions. I used buttercream icing in white, red, black and orange. I used the viva towel to smooth out the nose, eyes and mouth. I used a star tip for the red.